I want to explore what the preposition into reveals about Rhizo14. I have chosen to work with into for a couple of reasons. First, it is manageable, with only 33 instances in the auto-ethnography text (AE) as it existed in November, 2014. (I have to give a date because the text keeps changing as any rhizomatic document should do.) The preposition of occurs 652 times, but I feel overwhelmed at the prospect of mapping that many connections until I develop a better command of Voyant tools. My hope is that into will reveal some patterns in Rhizo14 that will scale up to 652. Of course, into has more definitions, some quite figurative, which I will get to later, but this hint of physical action, enclosure, and contact in all uses of the word attracts me. My project – if you can call it that – for Rhizo14 has been to bring as much of this busy fizzy messy stuff as possible into my first year #becomingeducational module and see what it sparks in first year students who in the end want to become educationalists. I never actually go into a MOOC planning to study the process, but because i am an educator and researcher i am always interested in the process or pedagogy of a learning experience and that is what draws me to research ideas, understanding learner experience, etc. (btw it was the facebook group more than anything else that did it for me, but also that i was blogging and interacting with other ppl on their blogs and learning how to use my blog to integrate ideas - and i have to admit that iPad and smartphone notifications about news on all these helped me keep track BUT it was mainly the people themselves and the way we were all "into it" that made it special. Inclusiveness, I translate it into “willingness to include others in my learning, willingness to take care of the learning of my peers”. well firstly it's easy to drop out of something you serendipitously drop into & I don’t think that’s any bad thing. This ‘culture’ increased into the end and I stopped writing. I think this was honestly the thing that drew me fully into the group, because I felt like I owed people some reciprocal attention AND the conversations happening around that time were pretty lively. I was able to take the ideas from the conversations into interactions with colleagues and was excited by their excitement, even though none of them had been able to follow the class. It had all been funneled down to me, and it had somehow sunk in and taken the shape of an education that worked at its ultimate purpose: getting me into a federal university, a luxury (still to this day) to a select few, to an intellectual elite, to the middle-class kids who were (and still are) pushed to make a career choice many a times too soon, one that they’d very likely not practice in their professional future, one that they’d probably just drop midway through college (those who were brave enough to stand up to the status quo, that is). I had turned into a teacher in my own right, but how much of my teaching persona had also become a replication of what I had experienced as a learner during my school years? I have had an insight into what Paulo Freire advocates in Education and Change. Being in a small town I frequently run into those I worked with and it’s awkward and unpleasant. I just combined the course materials and objectives into a mash-up which I found energizing and enjoyable, and was pleased to see that several peers thought so too. Arrived late, hence felt like an outsider, tended to snipe from the sidelines, associating freely anything that came into my head. Initially, I took several days off from my other activities and spent up to 10 hrs each day following links, reading, and copy/pasting material and URLs into my Google docs. From about week 3, I probably logged into FB about once a week and just scanned some of the discussions, and sometimes followed a link out to a blog post (this was actually how I found Clarissa Bezerra’s blog, which I’m very glad to have found). I found myself reflecting on it all the time, and it’s evolved my thinking on a range of things, and introduced me to some new people some of whom will develop into closer ties over time. More specifically, I like that he is able to convert his ideas into real-world courses much better than I, so I wanted to see what he was doing with this MOOC. As I mentioned, Dave and I have been discussing rhizomatics for a number of years now, and Jenny, Frances, Christina, and I have been extending that discussion into the wider topic of complexity in general and education within complex systems in particular. Evident there are pre-existing connections so going to come into that based on what your level of contribution. Never really got into having a blog, e.g., to anchor this learning, but had started one for another reason. Now looking back and into the other platforms for other threads. The online storm of tweets turned into soft, solid conversations in RT. The P2PU platform rather disappeared into the background for me. Still, there is much I would like to go back to delve into that I missed, and some that I would like to review at my leisure. I think that exclusion/inclusion in the community is tied into one’s perspective of navigating the learning journey. I did not delve into arenas in which I was not particularly interested, or felt were not helpful to advancing my learning and further engagement. (online friends, sounded a bit twee to me, I call my friends “friends”, don’t categorise them into one and off line boxes). Stopping this document feels like forcing a continuing process (for me) into a completeness that I don’t feel nor care about. that [pre-existing connections] based on … your level of contribution. the other platforms for other threads. soft, solid conversations in RT [real time]. one’s perspective of navigating the learning journey. a completeness that I don’t feel nor care about. I do not make any strong claims for this image. Its insights, if any, are suggestive rather than definitive, not least because a static image does not accurately capture a swarm. A movie is better, though still erroneous in that it frames the swarm, effectively eliminating the environment, which is critical for understanding the swarm (probably for understanding anything). Voyant has some tools which capture dynamic relationships among entities, and when I learn the tools well enough, I may be able to present a better and more enlightening representation of the behavior of the iSwarm in Rhizo14, but this image is what I have now, and it clarifies and extends my thinking about Rhizo14. First, keep in mind that this is an image of the 33 connections generated by only one preposition used by only 33 Rhizo14 participants. It's a bit like studying a swarm of locusts by isolating this little cluster of 33 locusts (if such a thing is possible) and trying to infer insights into the swarm through observation of this cluster. It's always possible that this cluster is atypical—indeed, I'm willing to bet that most clusters are atypical of the swarm. I'm using a narrow frame around 33 connections to keep from overwhelming myself, but that frame changes what I see. Still, though frames distort our knowledge, they also seem to be necessary for whatever knowledge we have. If I keep that in mind, then I may be restrained from making too bold a claim about this cluster of connections. The geography of the iSwarm itself spans Australia, Brazil, Canada, Egypt, England, Finland, Scotland, and the United States, and those are just the places I can quickly identify. All from 33 prepositions. Just wait until I add the 652 of connections, the 455 in connections, and the other prepositions. That's thousands of connections from a mere 33 Rhizo14 participants, and that's only the handful of connections that they happened to recall and report in their auto-ethnographic entries. I trust that you are as impressed with the overwhelming rich complexity of Rhizo14 as I am. I don't think I am being too bold in asserting that this one cMOOC from last year has an incredible countless number of pathways into and out of the world at large and an equally large number of internal interconnections. I know this because I see the data generated by following just 33 instances of one preposition which suggest that I am mapping something very large and complex whose shape is only dimly emerging for me. I say whose on purpose. This may be too bold, but I'll say it anyway: it seems to me that I am mapping a self-organizing, functioning consciousness, and I'm one of its neurons. That expands the field of reality for me. Okay, back to the ordinary reality for which I have concrete evidence. What do all these demonstrated and implied connections say about Rhizo14? In the above image, I tried to arrange various actors, entities, and spaces by whether or not I thought they were in or out of Rhizo14. The red cloud is definitely in and the borders of the yellow cloud are more out. This was not easy. For instance, is Facebook in Rhizo14 or not? Clearly not all of FB, but the FB Rhizo14 group was very important to and active in Rhizo14, more so than the Google+ group, so I listed FB halfway in and Google on the boundary. Likewise with conversations, many of which were clearly inside Rhizo14, but some of which bled into the outside. Again, my arrangement is suggestive rather than definitive, but it helps me visualize something that I believe is real and that ties into Deleuze and Guattari's concept of decalcomania and into Cillier's exploration of boundaries. Boundaries connect rather than separate. They may distinguish one thing from another, but they also connect those things. Even when we are trying to separate ourselves from a thing—as iCarol does above when she writes, "I did not delve into arenas in which I was not particularly interested"—she has connected herself to those arenas. This is similar to Lakoff's assertion that when we say do not think of an elephant, we must think of an elephant (note that I'm most mindful of Lakoff's ideas about frames in this post). Boundaries may help us manage the exchanges we make with other entities, even stopping some exchanges, but they also connect us to the other arena and make some exchange inevitable. We are always stained by whatever bounds us. Stains bring me to decalcomania, which I think of as a staining process, which always works both ways: I stain those things near me in the physical, mental, and virtual worlds, and nearby things stain me in return. When children stain the paper with their handprints, their hands are stained in return. When I touch a grape, the red gets on my fingers, and my fingers leave a print. When I discuss issues with another, my words stain them, and their words stain me. It is necessarily so, even if I reject their words. My knowledge of Al-Anon tells me that we are most often connected to and affected by, stained by, those we try most to avoid. 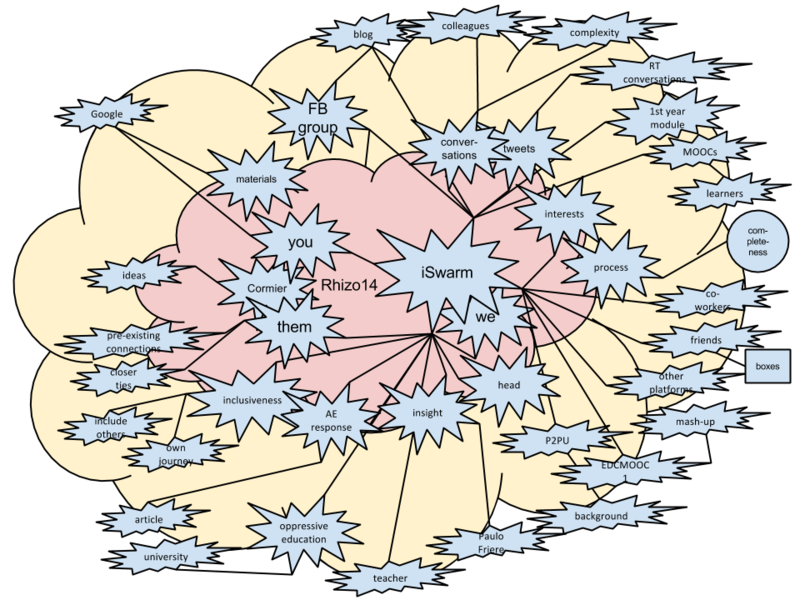 Rhizo14, then, is stained by all those connections with all those outside entities, and in turn, it stains those entities. Given the number of connections, this is an amazing amount of exchange of energy, matter, information, and organization. The boundary between Rhizo14 and the outside world is not at all neat. A boundary is seldom very distinct and fine beyond a specific scale. What I mean can be illustrated by a wine stain on a carpet. When I'm standing up looking down on the stain, it looks quite compact and discrete with a distinct boundary, but when I kneel down to look more closely, I see that the boundary is not so distinct. It bleeds into the surrounding fibers. And if I use a magnifying glass, then I see that the stain spreads more and more, growing fainter at the edges until it finally fades into the color of the carpet. If I could look even more closely, I would likely see even more texture and spreading in the boundary of the stain. Clearly, a boundary is distinct only at a certain scale. This may be true even for black holes, which may have the most absolute and distinct boundaries in all of nature. Recent studies suggest that even those boundaries may bleed a bit of information back into the universe. If black holes bleed, then so does everything else. Rhizo14 certainly bleeds. See what it has done to my blog? Read Maha's blog, Simon's, or Clarissa's. Rhizo14 has stained us all, and I can map that stain by following the prepositions in the AE. Just as certainly, though, Rhizo14 itself was stained. This makes great sense and is at the core of Cormier's concept of the community as curriculum: the connections forged by the community stain the curriculum that emerges within that community. That Dave showed up, of course, changed the dynamics of Rhizo14, but not much more than when the rest of us showed up. And all those lurkers. The stains flowed through them as well, both in and out of Rhizo14. Indeed, given that the lurkers outnumbered the active participants, the stain from their presence is likely greater than the stain from 30 or so active people. And the stains are not limited to the active and passive participants in Rhizo14. In their book Connected: The Surprising Power of Our Social Networks and How They Shape Our Lives (2009), Nicholas A. Christakis and James H. Fowler note that the influence of people extends out to about three degrees of separation. In other words, the patterns of our own lives influence our immediate connections, our connections' connections, and our connections' connections' connections. After that, the potency of our patterns of behavior and belief fade and lose their efficacy, just like the wine stain in the carpet. But think what this means: the range of behaviors and beliefs that emerged in Rhizo14 stain not only us participants but our immediate family, friends, colleagues, and associates, then their family, friends, colleagues, and associates, and finally their family, friends, colleagues, and associates. I won't try to repeat Christakis and Fowler's argument, but to my mind, they make a strong case, and until someone makes a better case, I'm inclined to believe them. Thus, Rhizo14 has stained far more than a few hundred participants. Far more. And I have the prepositions to prove it. Now, I am not asserting that all those people have turned into rhizomatic educationists. That's absurd. Many of them may vehemently reject rhizomatic education, but they have been stained none the less, even if they never heard of Rhizo14. Something of the pattern has reached them, and the prepositions map the pathways through which the stain flowed. Finally, lest we Rhizo14ers be confused by the extent of our influence, remember that every entity has the same sort of staining power to greater or lesser degree. And keep in mind that the great world stains us far more than we stain it. Even the educational world stains us more. It's vastly bigger and it has more stain to spread. The universe, of course, is infinitely bigger. Next I want to talk about how prepositions map our connections by connecting our words.